The normal response to kidney injury includes a robust inflammatory infiltrate of PMNs and macrophages. We previously showed that the small secreted protein breast regression protein–39 (BRP-39), also known as chitinase 3–like 1 (CHI3L1) and encoded by the Chi3l1 gene, is expressed at high levels by macrophages during the early stages of kidney repair and promotes tubular cell survival via IL-13 receptor α2 (IL13Rα2)–mediated signaling. Here, we investigated the role of BRP-39 in profibrotic responses after AKI. 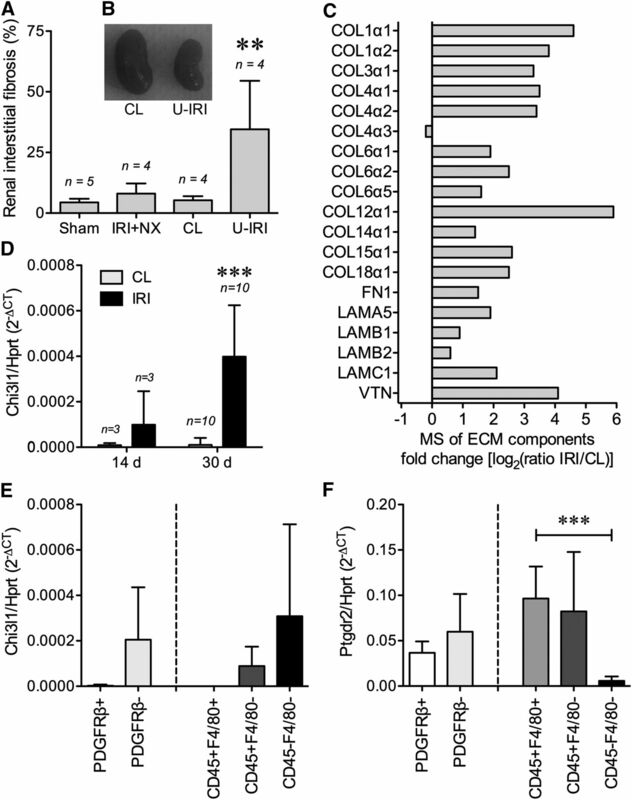 In wild-type mice, failure to resolve tubular injury after unilateral ischemia-reperfusion injury (U-IRI) led to sustained low-level Chi3l1 mRNA expression by renal cells and promoted macrophage persistence and severe interstitial fibrosis. Analysis of macrophages isolated from wild-type kidneys 14 days after U-IRI revealed high-level expression of the profibrotic BRP-39 receptor Ptgdr2/Crth2 and expression of the profibrotic markers Lgals3, Pdgfb, Egf, and Tgfb. In comparison, injured kidneys from mice lacking BRP-39 had significantly fewer macrophages, reduced expression of profibrotic growth factors, and decreased accumulation of extracellular matrix. BRP-39 depletion did not affect myofibroblast accumulation but did attenuate myofibroblast expression of Col1a1, Col3a1, and Fn1. 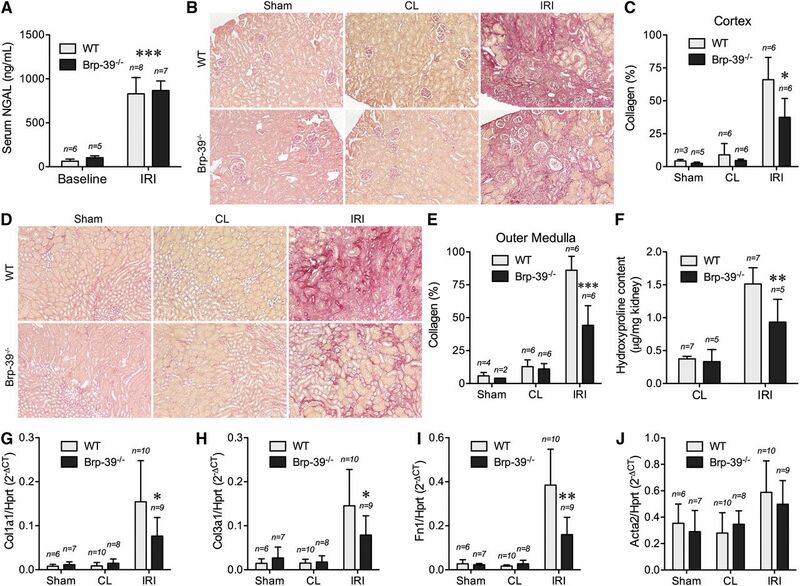 Together, these results identify BRP-39 as an important activator of macrophage-myofibroblast crosstalk and profibrotic signaling in the setting of maladaptive kidney repair. We have found that intrarenal macrophages express high levels of the small secreted protein Breast regression protein–39 (BRP-39; gene name chitinase 3–like 1 [Chi3l1]) after IRI of the kidney and that BRP-39 plays a key role in promoting tubular cell survival during the early peak of the proinflammatory milieu.14 This effect is dependent on BRP-39 activating PI3K-dependent cell survival signaling via IL-13 receptor α2 (IL13Rα2).15 Recently, Elias and colleagues16,17 have found that BRP-39 can bind to and activate a second receptor, chemokine receptor homologous molecule expressed on Th2 lymphocytes (CRTH2; also called prostaglandin D2 receptor 2 [PTGDR2]), that induces profibrotic signaling in the setting of lung injury. This led us to investigate whether sustained BRP-39 expression after AKI can promote macrophage persistence and subsequent profibrotic responses in the kidney. To test this hypothesis, we analyzed kidneys from wild-type and Brp-39−/− mice 14 and 30 days after unilateral IRI. We show that, in the setting of maladaptive tubule repair, there is persistent low-level expression of Chi3l1 by endogenous renal cells, whereas CD45+F4/80+ macrophages and platelet-derived growth factor receptor β+ (PDGFRβ+) myofibroblasts express high levels of the profibrotic BRP-39 receptor Ptgdr2/Crth2. The absence of BRP-39 results in reduced macrophage numbers, reduced expression of profibrotic growth factors including Pdgfb, transforming growth factor β (Tgfβ), and epidermal growth factor (Egf), and reduced kidney fibrosis. The change in fibrosis correlates with reduced extracellular matrix gene expression by PDGFRβ+ cells isolated from the Brp-39−/− kidneys, suggesting that chronic upregulation of BRP-39 acts to promote a profibrotic state in the kidney. Wild-type mice were subjected to either unilateral IRI with contralateral nephrectomy, unilateral ischemia-reperfusion injury with the contralateral kidney intact (U-IRI), or sham surgery. The kidneys were collected on day 30 after surgery and analyzed for fibrosis. Consistent with recent results from Le Clef et al.,18 Masson trichrome staining showed that IRI in mice with contralateral nephrectomy did not result in a significant increase in renal fibrosis compared with sham surgery, whereas U-IRI led to failure of normal repair and instead, significantly increased renal fibrosis compared with either sham-operated or the contralateral uninjured kidney (Figure 1A). Morphologically, the contralateral kidney was hypertrophied, whereas the U-IRI kidney had atrophied (Figure 1B). Mass spectrometry (MS) analysis of both the injured and contralateral kidneys on day 30 revealed increased extracellular matrix proteins in the injured kidneys, including major fibrotic components collagen α-1(I), collagen α-1(III), fibronectin, and laminin (Figure 1C). The level of Chi3l1 mRNA expression progressively increased in the U-IRI kidney compared with the contralateral kidney (Figure 1D). Analysis of FACS sorted cells from kidneys 14 days after U-IRI (Supplemental Figure 1) showed that Chi3l1 expression was predominantly found in the CD45− and PDGFRβ− endogenous renal cell population, with CD45+F4/80+ macrophages and PDGFRβ+ myofibroblasts expressing minimal levels of the ligand but much higher levels of the profibrotic BRP-39 receptor Ptgdr2/Crth2 (Figure 1, E and F). BRP-39 is upregulated in renal fibrosis induced by unilateral IRI. WT mice were subjected to sham surgery, 30 minutes warm unilateral IRI with contralateral nephrectomy (IRI+NX), or 30 minutes warm unilateral IRI (U-IRI) with the contralateral (CL) kidney intact. (A) Renal interstitial fibrosis scoring was determined in a blinded fashion using Masson trichrome staining on day 30 postsurgery. **P<0.01 versus sham or CL kidney. (B) Representative CL kidney and unilateral IRI kidney were imaged on day 30 postsurgery. (C) Three individual unilateral IRI kidneys and the CL kidneys were collected on day 30 postsurgery and pooled, and protein lysates were subjected to liquid chromatography–mass spectrometry (LC-MS/MS) analysis for extracellular matrix (ECM) component identification and relative quantification. (D) Quantitative RT-PCR analysis for Chi3l1 was performed on the kidney RNA harvested on day 14 or 30 postsurgery. (E and F) Cells freshly isolated from six kidneys 14 days after U-IRI were separately FACS sorted for either PDGFRβ± (left side) or CD45±F4/80± (right side) followed by RNA extraction and quantitative PCR analysis of the indicated cell populations for either (E) Chi3l1 or (F) Ptgdr2. Hprt, hypoxanthine-guanine phosphoribosyltransferase; n, number of kidneys analyzed. ***P<0.001. To determine the functional role of BRP-39 in renal fibrosis, wild-type and Brp-39−/− mice were subjected to 30 minutes of U-IRI. Consistent with our previous demonstration that initial injury was functionally equivalent in Brp-39−/− and wild-type mice,14 serum neutrophil gelatinase–associated lipocalin (NGAL) levels were increased 1 day post–U-IRI to the same degree in both genotypes (Figure 2A). Picrosirius red staining on day 30 after injury showed that Brp-39−/− mice had significantly less renal interstitial collagen deposition in the ischemically injured kidney in both the cortex (Figure 2, B and C) and outer medulla (Figure 2, D and E) compared with wild-type mice. Analysis of hydroxyproline content confirmed the reduced level of fibrosis in the injured Brp-39−/− kidneys (Figure 2F). Quantitative PCR analysis revealed that mRNA expression levels of three representative extracellular matrix components, Col1a1, Col3a1, and Fn1, were significantly less upregulated in the injured Brp-39−/− kidneys (Figure 2, G–I), whereas expression of the myofibroblast surrogate marker α-smooth muscle actin (Acta2) was not different between injured wild-type and Brp-39−/− kidneys (Figure 2J). BRP-39 promotes renal interstitial fibrosis induced by unilateral IRI. (A) Serum NGAL levels of mice were determined by ELISA at 1 day after unilateral IRI. n, number of mice. ***P<0.001 versus baseline. (B–E) Sham-operated, unilateral IRI, and contralateral (CL) kidneys were harvested at 30 days postsurgery, and kidney sections were stained with Picrosirius red. (B) Representative images of cortex with Picrosirius red area quantified in C. (D) Representative images of outer medulla with Picrosirius red area quantified in E. *P<0.05 versus wild-type (WT) IRI kidney; ***P<0.001 versus WT. (F) The hydroxyproline content in the kidneys was determined and normalized to kidney weight. **P<0.01 versus WT IRI kidney. (G–J) Quantitative RT-PCR for Col1a1, Col3a1, Fn1, and α-smooth muscle actin (Acta2) was performed on whole-kidney mRNA. Hprt, hypoxanthine-guanine phosphoribosyltransferase; n, number of kidneys analyzed. *P<0.05 versus WT IRI kidney; **P<0.01 versus WT IRI kidney. To determine if the reduced fibrosis seen after injury in the Brp-39−/− mice was due to reduced myofibroblast accumulation in the absence of BRP-39, we analyzed the expression of PDGFRβ-expressing cells in the fibrotic and contralateral kidneys. At the whole-kidney level, mRNA and protein expression of PDGFRβ were significantly increased in the injured kidney 30 days after U-IRI (Figure 3, A–C). Consistent with the α-smooth muscle actin mRNA expression data, PDGFRβ mRNA and protein expression were not significantly different in the injured wild-type and Brp-39−/− kidneys. Immunohistochemical (IHC) staining for PDGFRβ revealed a significant increase in PDGFRβ+ cells in the cortical (Figure 3, D and E) and outer medullary (Figure 3, F and G) interstitium after U-IRI in both wild-type and Brp-39−/− mice compared with the contralateral and sham-operated kidneys. 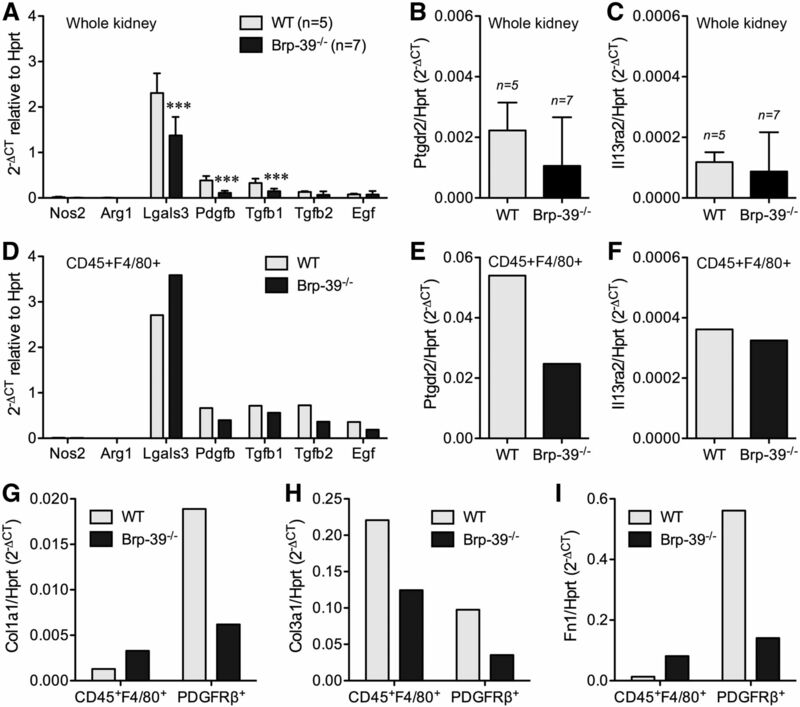 No difference in the numbers of PDGFRβ+ cells was found between wild-type and Brp-39−/− mice. BRP-39 is not required for intrarenal myofibroblast accumulation after unilateral IRI. Sham-operated, unilateral IRI, and contralateral (CL) kidneys were harvested at 30 days after unilateral IRI. (A) Quantitative RT-PCR for Pdgfrb was performed on whole-kidney mRNA. (B) Western blot analysis for PDGFRβ protein expression was performed on whole-kidney lysates (each lane is from a separate kidney). (C) Relative PDGFRβ protein levels (as in B) were quantified and normalized to β-actin (ACTB). (D–G) Kidney sections were immunostained with anti-PDGFRβ and imaged in the (D) cortex ([E] quantified using ImageJ) and (F) outer medulla (quantified in G). The boxed regions in the third columns of D and F are shown at higher magnification in the fourth columns to highlight the interstitial location of the PDGFRβ staining. Hprt, hypoxanthine-guanine phosphoribosyltransferase; n, number of kidneys analyzed; T, tubule; WT, wild type. We have previously shown that macrophages accumulate normally during the first 3 days after IRI in Brp-39−/− mice.14 Because macrophage persistence after injury has been shown to correlate with kidney fibrosis after IRI,12 we examined macrophage numbers 30 days after unilateral IRI in wild-type and Brp-39−/− mice. 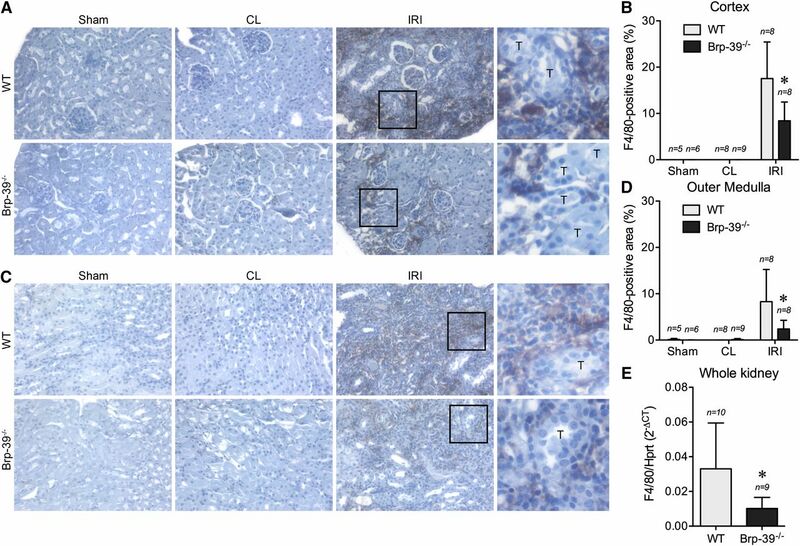 IHC staining for F4/80 revealed increased macrophage numbers in wild-type mice after IRI in both the renal cortex and outer medulla (Figure 4, A–D). This late persistence of macrophages was significantly attenuated in the renal cortex and outer medulla of Brp-39−/− mice. Consistent with the IHC staining, mRNA expression of F4/80 at the whole-kidney level was significantly decreased at day 30 in the injured Brp-39−/− kidneys compared with wild-type kidneys (Figure 4E). BRP-39 is required for intrarenal macrophage persistence after unilateral IRI. Sham-operated, unilateral IRI, and contralateral (CL) kidneys were harvested at 30 days after unilateral IRI. The kidney sections were immunostained with anti-F4/80 and imaged in the (A) cortex (quantified in B) and (C) outer medulla (quantified in D). *P<0.05 versus wild-type (WT) IRI kidney. (E) Quantitative RT-PCR analysis for F4/80 was performed on whole-kidney mRNA. *P<0.05. The boxed regions in the third columns of A and C are shown at higher magnification in the fourth columns to highlight the interstitial location of the F4/80 staining. n, number of kidneys analyzed; T, tubule. Analysis of whole-kidney mRNA 14 days after U-IRI revealed that the typical proinflammatory macrophage marker inducible nitric oxide synthase (Nos2) and reparative macrophage marker arginase 1 (Arg1) were present at very low levels, whereas the profibrotic macrophage marker galectin-3 (Lgals3) and the profibrotic growth factors Pdgfb, Tgfb, and Egf were more highly expressed (Figure 5A). Of these, Pdgfb and Tgfb1 showed significantly higher expression in injured wild-type kidneys compared with injured Brp-39−/− kidneys. Of the two known BRP-39 receptors, the profibrotic BRP-39 receptor Ptgdr2/Crth2 was expressed at a tenfold higher level in the fibrotic kidneys than Il13ra2 (Figure 5, B and C). To define the cellular source of these profibrotic genes, wild-type and Brp-39−/− injured kidneys were harvested 14 days after U-IRI and FACS sorted for CD45+F4/80+ cells (macrophages) and PDGFRβ+ cells (myofibroblasts). Serum NGAL concentrations 1 day after U-IRI again confirmed that both wild-type and Brp-39−/− mice were subjected to the same degree of initial injury (data now shown). The isolated macrophages from wild-type injured kidneys confirmed the low levels of Nos2 and Arg1 expression, with high levels of Ptgdr2/Crth2 as well as Lgals3, Tgfb, Pdgfb, and Egf (Figure 5, D–F). Macrophages isolated from the Brp-39−/− kidneys were significantly fewer in number but showed a similar pattern of low expression of proinflammatory and reparative gene expression with high expression of profibrotic genes. BRP-39 promotes macrophage and myofibroblast matrix expression after unilateral IRI. (A–C) Quantitative RT-PCR analyses for (A) Nos2, Arg1, Lgals3, Pdgfb, Tgfb1, Tgfb2, and Egf as well as (B) Ptgdr2 and (C) Il13ra2 were performed using mRNA from whole kidneys collected 14 days after U-IRI. n, Number of kidneys analyzed. ***P<0.001 versus wild-type (WT). (D–F) Quantitative RT-PCR analyses for (D) Nos2, Arg1, Lgals3, Pdgfb, Tgfb1, Tgfb2, and Egf as well as (E) Ptgdr2 and (F) Il13ra2 were performed using mRNA from CD45+F4/80+ cells pooled from three WT and three Brp-39−/− kidneys. (G–I) Quantitative RT-PCR analyses for (G) Col1a1, (H) Col3a1, and (I) Fn1 were performed using mRNA from CD45+F4/80+ cells and PDGFRβ+ cells pooled from three WT and three Brp-39−/− mouse kidneys collected 14 days after U-IRI, respectively. Hprt, hypoxanthine-guanine phosphoribosyltransferase. Examination of major extracellular matrix components of fibrosis revealed that intrarenal myofibroblasts from wild-type mice expressed more Col1a1, Col3a1, and Fn1 than myofibroblasts from Brp-39−/− mice (Figure 5, G–I), consistent with the whole-kidney mRNA analysis (Figure 2, G–I). Interestingly, macrophages were found to be the dominant source of mRNA for Col3a1 rather than myofibroblasts, again with a substantial decrease seen in the Brp-39−/− cells (Figure 5H). These results show that BRP-39 is required for intrarenal macrophage persistence as well as maximal expression of profibrotic growth factors, possibly via the CRTH2 receptor, which activate both intrarenal myofibroblasts and macrophages to express matrix components. To determine whether BRP-39 is a critical driver of fibrosis in other forms of kidney injury, we investigated the effect of BRP-39 in a more rapid model of renal fibrosis, UUO.19 Analysis of the UUO and contralateral kidneys 10 days after UUO revealed a significant and equal increase in Picrosirius red–stained interstitial collagen as well as mRNA for Col1a1, Col3a1, and Fn1 in the UUO kidney compared with the contralateral kidney in both wild-type and Brp-39−/− mice (Supplemental Figures 2 and 3, A–C) and a similar induction of profibrotic macrophage gene expression in both genotypes (Supplemental Figure 3, D–I). Consistent with this, Chi3l1 mRNA expression in the wild-type kidneys subjected to UUO was not significantly increased at 10 days in this model of injury (Supplemental Figure 3J). In this study, we use a model of unilateral IRI, in which the contralateral kidney remains intact to study maladaptive repair. In contrast to the model of unilateral IRI with contralateral nephrectomy, in which the injured kidney repairs normally with minimal fibrosis (Figure 1A), the unilateral IRI with contralateral kidney intact model has been found by us and other groups to result in maladaptive repair with progressive interstitial fibrosis and atrophy of the injured kidney rather than normal repair (Figure 1, A and B).18 Analysis of these kidneys shows that macrophages persist in large numbers in the renal interstitium for at least 30 days after U-IRI but are not the source of the sustained low-level BRP-39 expression. Instead, CD45− and PDGFRβ− cells, presumably endogenous tubular and/or endothelial cells that have failed to fully repair after U-IRI, are the major source of sustained late BRP-39 expression, whereas the adjacent CD45+F4/80+ macrophages and the PDGFRβ+ myofibroblasts express the profibrotic BRP-39 receptor, Ptgdr2/Crth2. Consistent with an important role for this paracrine signaling pathway in the promotion of kidney fibrosis, in the absence of BRP-39, there is an approximately 40% reduction in all measures of fibrosis in the U-IRI kidneys. In addition to our demonstration that BRP-39 can stimulate IL13Rα2-dependent prosurvival signaling in renal tubular cells, Lee et al.20 have shown that BRP-39 can promote macrophage survival and accumulation in the injured lung. We, therefore, analyzed interstitial macrophage numbers in control and ischemically injured kidneys from wild-type and Brp-39−/− mice and found that macrophage numbers were significantly reduced in Brp-39−/− kidneys 30 days after IRI (Figure 4). Because our prior analysis of macrophage numbers during acute IRI revealed equal accumulation of macrophages in the wild-type and Brp-39−/− kidneys in the first 3 days after injury, we currently hypothesize that BRP-39 is not required for macrophage homing in response to injury but is required for macrophage persistence beyond the first week after injury. The link between inflammatory responses to injury and subsequent organ fibrosis is well documented, but the mechanism by which prolonged macrophage infiltration leads to fibrosis is not as well understood. To pursue this mechanism, we performed FACS sorting of macrophages on day 14 after unilateral IRI, because we felt that this time point was useful in identifying the signals that were most likely to be driving the overt fibrosis seen on day 30. Consistent with results by other groups,10,19 we find that macrophages isolated from the injured kidneys of wild-type mice express a profibrotic phenotype with high levels of mRNA for Lgals3, Pdgfb, Egf, and Tgfb (Figure 5). Interestingly, not only are there significantly fewer macrophages in the injured Brp-39−/− kidneys, but also, those that are present are expressing less of each of these profibrotic growth factors. These results suggest that BRP-39 is required for both macrophage survival/persistence and profibrotic gene expression. A recent study by Zhou et al.16 provides a probable explanation for this dual signaling role. They show that, although BRP-39 signals through IL13Rα2 to induce prosurvival signaling, a second BRP-39 receptor, CRTH2, is responsible for profibrotic signaling. Our quantitative PCR analysis of macrophages sorted from wild-type and Brp-39−/− fibrotic kidneys on day 14 shows that both receptors are expressed by these cells, with an approximately 100-fold higher level of Crth2 mRNA expression than Il13ra2. Thus, in the absence of BRP-39, there is likely to be reduced macrophage survival (leading to the overall decrease in macrophage numbers) as well as less expression of profibrotic growth factors by those macrophages that are present. The cell type believed to be directly responsible for most extracellular matrix expression during kidney fibrosis is the αSMA+, PDGFRβ+ myofibroblast.10 Crosstalk between macrophages and myofibroblasts has been shown by several groups, including evidence that macrophage-secreted PDGFβ can drive perictye-myofibroblast transformation.19 Our analysis of the fibrotic kidneys confirms that PDGFRβ+ myofibroblasts are significantly increased in the interstitium on day 30 after U-IRI and also express high levels of the profibrotic BRP-39 receptor Ptgdr2/Crth2. Although the number of myofibroblasts is not different between wild-type and Brp-39−/− kidneys, mRNA expression of the extracellular matrix genes Col1a1, Col3a1, and Fn1 was reduced by approximately 65%–75% in the Brp-39−/− myofibroblasts (Figure 5). Interestingly, Col3a1 was more highly expressed by macrophages than by myofibroblasts, again with a substantial reduction in the absence of BRP-39. This ability of macrophages to directly express matrix genes is consistent with data from Wang and colleagues21 showing that CD45+ monocytes can directly contribute to fibrosis in the injured kidney. Thus, BRP-39–dependent growth factor expression by macrophages does not seem to be required for myofibroblast accumulation after IRI but is important for matrix gene expression by both myofibroblasts and macrophages. In addition to the unilateral IRI model of kidney injury and fibrosis, we also examined the importance of BRP-39 in UUO. This type of injury is perhaps the best studied in murine kidney fibrosis, and again, macrophages seem to play a major role.13 Interestingly, a whole-body knockout of Ptgdr2/Crth2 has been shown to modestly diminish kidney fibrosis 10 days after UUO.22 However, we did not find a significant effect of Brp-39 knockout on kidney fibrosis 10 days after UUO. Consistent with this, we also did not see a significant increase in Chi3l1 mRNA expression at the 10-day time point. There are several possible explanations for this difference between knockout of the ligand, BRP-39, and the receptor, CRTH2, and between our different models of injury (IRI versus UUO). Brp-39 expression is not significantly increased at 10 days after UUO. Thus, it is possible that profibrotic signaling at early time points after renal injury is predominantly BRP-39 independent. Consistent with this possibility, CRTH2 has also been shown to serve as a receptor for prostaglandin D2 (PGD2), and the study by Ito et al.22 shows that PGD2 is made by the renal tubular cells and that the PGD2 synthase is highly upregulated by day 5 after UUO. Alternatively, it is possible that UUO and IRI result in mechanistically distinct mechanisms of fibrosis due to different modes of tubular and endothelial cell injury (sustained obstruction versus transient ischemia followed by reperfusion). In summary, our study is consistent with a model whereby tubular cells and/or endothelial cells that cannot undergo normal repair after IRI maintain low-level BRP-39 expression that, in turn, signals to promote macrophage survival and profibrotic gene expression as well as myofibroblast-dependent matrix gene expression (Figure 6). Thus, therapies directed against sustained BRP-39 expression and/or PTGDR2/CRTH2-dependent profibrotic signaling would be logical targets to be considered in prevention of progressive fibrosis after ischemic AKI. 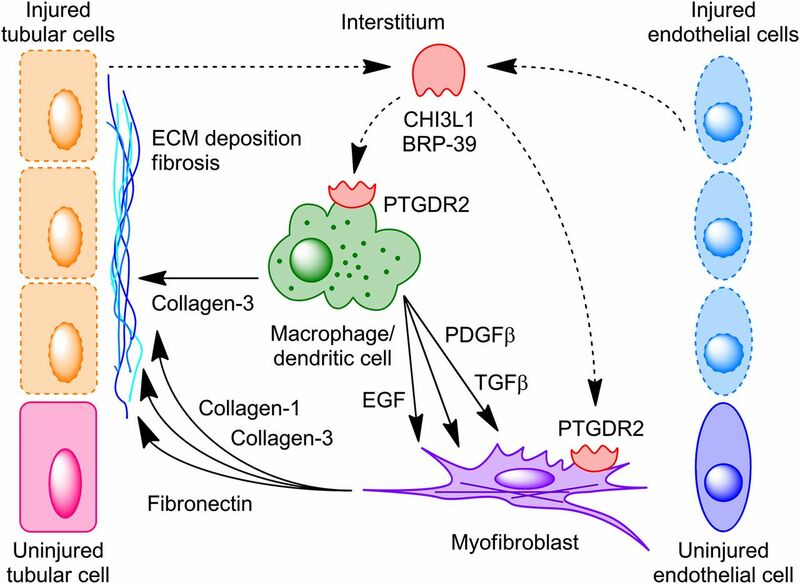 A proposed model of BRP-39–mediated macrophage-myofibroblast crosstalk during kidney fibrosis. Sustained low-level expression of BRP-39 by nonrepaired tubular cells and/or endothelial cells is proposed to activate the PTGDR2/CRTH2 receptor on macrophages, inducing their secretion of both collagen-3 and profibrotic growth factors, such as PDGFβ and TGFβ; this, in turn, can act separately or cooperatively with BRP-39 to stimulate myofibroblast expression of additional extracellular matrix (ECM) components, including collagen-1 and fibronectin. Dashed lines, proposed signaling; solid lines, analyzed signaling. All animal protocols were approved by the Yale University Animal Care and Use Committee. Male wild-type and Brp-39−/− mice (9–11 weeks old) were subjected to anesthesia by intraperitoneal injection with ketamine on a 37°C warming pad. All mice were on the C57BL/6 background. To establish the unilateral IRI model, the abdomen was opened, and warm renal ischemia was induced using a nontraumatic microaneurysm clip (FST Micro Clamps) on the left renal pedicle for 30 minutes. To establish the UUO model, the mouse flank was opened, and the right ureter was ligated twice using 4/0 nylon surgical sutures at the level of the lower pole of the kidney. During surgery, the mice were intraperitoneally injected with normal PBS and Buprenex to avoid dehydration and postoperative pain, respectively. Blood and tissue samples were obtained at the indicated times after the surgery. Mouse blood was withdrawn at the indicated time points, and serum NGAL concentrations were measured using a mouse lipocalin-2/NGAL quantikine ELISA kit (R&D Systems) according to the manufacturer’s instructions. Protein lysates from three individual IRI and contralateral kidneys were pooled together and subjected to MS analysis at the Keck MS & Proteomics Resource of the W.M. Keck Foundation Biotechnology Resource Laboratory, Yale University School of Medicine. Proteins were identified on the basis of the label-free detection of tryptic peptides using an LC-MS/MS. Data were processed using the Progenesis LC-MS software, and proteins were identified using the Mascot search algorithm (Matrix Science). Kidneys were fixed in 4% paraformaldehyde and embedded in paraffin. For detection of collagen, deparaffinized kidney sections were rehydrated, stained with Picrosirius red in 1.3% picric acid for 1 hour, and counterstained with hematoxylin for 7 minutes. Masson trichrome staining was performed in the Research Histology Laboratory of the Department of Pathology at the Yale University School of Medicine. For detection of PDGFRβ+ and F4/80+ cells, deparaffinized kidney sections were rehydrated in graded alcohols (100%, 95%, 90%, 80%, and 70%), microwaved in antigen retrieval systems (BD Biosciences) for 10 minutes, and endogenous peroxidase activity quenched by incubation in 3% (vol/vol) H2O2 for 15 minutes. The sections were incubated with the primary mAb against PDGFRβ (Cell Signaling Technology) or F4/80 (eBiosciences) for 1 hour. After the sections were washed with TBS, and the immobilized antibodies were detected by ABC kit (Vector Laboratories). DAB (Vector Laboratories) and hematoxylin (Thermo Fisher Scientific) were used as the chromogen and the nuclear counterstain, respectively. The primary antibodies were omitted as negative controls. All of the tissues slides were then imaged under a Nikon microscope using a magnification of ×200 for Picrosirius red staining and ×400 for IHC staining. Four to six independent fields in both cortex and outer medulla were analyzed per kidney, and the percentage area of Picrosirius red staining, PDGFRβ staining, or F4/80 staining was quantified using ImageJ (NIH). Collagen content in contralateral and IRI kidneys from wild-type and Brp-39−/− mice was determined using a Hydroxyproline assay kit (Sigma-Aldrich) according to the manufacturer’s instructions and normalized to the kidney weight. Kidneys were harvested, minced, incubated with Liberase and DNase-1 for 60 minutes (Roche Diagnostics), and filtered with a 40-mm cell strainer to obtain a single-cell suspension. For FACS, the cells were stained with the following antibodies: anti-PDGFRβ PE conjugated (eBioscience, San Diego, CA) or anti-CD45 PE conjugated (BD Biosciences, San Jose, CA) and anti-F4/80 FITC conjugated (eBiosciences) with the background set using the appropriate isotype controls. PDGFRβ+, PDGFRβ−, CD45+F4/80+, CD45+F4/80−, and CD45−F4/80− cells were collected and pooled together from three individual kidneys for mRNA analysis. Kidney RNA or FACS sorted cell RNA was extracted with an RNeasy Mini kit (Qiagen) and reverse transcribed (Invitrogen). Gene expression analysis was determined by quantitative real-time PCR using an iCycler iQ (Bio-Rad, Hercules, CA) and normalized to hypoxanthine-guanine phosphoribosyltransferase. The primer sequences were obtained from PrimerBank (https://pga.mgh.harvard.edu/primerbank/index.html). Data were expressed using the comparative threshold cycle (ΔCT) method, and mRNA ratios were given by 2−ΔCT. Kidney lysates were fractioned using an RIPA lysis and extraction buffer (Thermo Fisher Scientific), and Western blot analysis was completed with antibodies that react selectively with PDGFRβ (Cell Signaling Technology) and ACTB (Santa Cruz Biotechnology). The data were expressed as means±SD and analyzed using one-way ANOVA followed by Tukey multiple comparison test for subgroup comparison using Prism 5 (GraphPad Software). A value of P<0.05 was considered statistically significant. This work was supported by George M. O’Brien Kidney Center at Yale the National Institutes of Health grant T32-DK007276 (to T.A.M. and L.X.) and the National Institutes of Health grants U01 HL 108638 (to J.A.E. and L.G.C.) and R01 DK093771 (to L.G.C.). T.A.M. and L.X. contributed equally to this work. This article contains supplemental material online at http://jasn.asnjournals.org/lookup/suppl/doi:10.1681/ASN.2017010110/-/DCSupplemental.